We saw Singin’ in the Rain on Netflix this weekend. Why this film is so beloved is a mystery to me. It feels thrown together, like someone took a bunch of unrelated songs and wrote a plot around them. Which in fact is what they did. And the songs aren’t that great either. 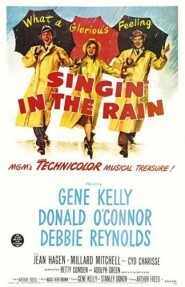 In particular, “Singin’ in the Rain” is not a great song . . . the melody is boring and it’s not a great lyric. The Cyd Charisse sequence seems to have been dropped in from a different movie. The Music Man is better. Mary Poppins is better. The King and I is better. My Fair Lady is better. That’s just off the top of my head. The Wizard of Oz is better, but I’m not sure that counts as a musical.